A South African magistrate is delivering his ruling on whether Oscar Pistorius, accused of murdering his girlfriend, should be freed on bail. The prosecution argues there is a risk Mr Pistorius, 26, may abscond and bail should be refused. After the final arguments, magistrate Desmond Nair began announcing his decision at about 2:30pm (12:30GMT). Reeva Steenkamp, 29, was a model and law graduate with a burgeoning television career. It’s been the quiet, rather overlooked subtext to the drama and detail emerging from Courtroom C: the shambolic state of South Africa’s police force. Given that this is perhaps the most high-profile murder investigation that South Africa has seen in years, it makes you wonder what happens in other, more ordinary, cases, and to begin to understand why, for instance, the conviction rate for alleged rapists is pitifully low, and why so many police dockets are reported to “disappear” from the files, allowing suspects to walk free. In his closing argument, lead prosecutor Gerrie Nel said that Oscar Pistorius’s version of events was “improbable” and there was a clear risk he would flee if granted bail. He said the athlete’s statement to the court suggested he thought “I’ve done nothing wrong” as there was no admission of culpable homicide. Oscar Pistorius knows he is “almost guaranteed” to serve a long term in prison, and he should not be treated differently because he is famous or because he has a disability, the prosecutor added. “He fired four shots, not one shot,” Mr Nel said. In response, lead defence lawyer Barry Roux reiterated that Mr Pistorius had no intent to kill Ms Steenkamp: he fired at what he thought was a burglar. Nair: detective conceded that defence version of shooting angle and position could be true. Three sketch artists busy working on portraits of #0scarPistorius. No cameras allowed to record his reaction when bail ruling comes. Nair: state planning to charge #OscarPistorius with possession of unlicensed ammunition. Nair: ends summary of #OscarPistorius evidence. Now on to prosecution and detective botha’s version. Nair summarises witness statements of growing love between #OscarPistorius and Reeva. If anything, his client should be charged with culpable homicide, not premeditated murder, the lawyer argued. “All the factors are present to show that he is not a flight risk,” Mr Roux said, adding that the athlete’s prosthetic limbs meant he could not go unnoticed through airport security. Oscar Pistorius hopes to resume training next week if he is granted bail, his coach Ampie Louw said as he arrived at court. If denied bail, he could face months in prison before a full trial begins later this year. Prosecutors say Mr Pistorius fired four shots through a locked toilet door as Ms Steenkamp cowered on the other side. She was hit in the head, arm and hip. 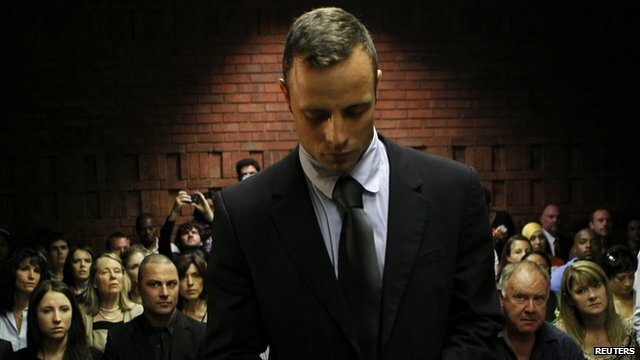 Mr Pistorius admits firing the shots, but says he was acting in self-defence against what he thought was an intruder. Prosecutor Gerrie Nel said Mr Pistorius had the “money, means and motive,” to abscond abroad if he was given bail. But defence lawyer Barry Roux said Mr Pistorius’s prosthetic limbs would make it difficult to escape the country, as they could not go through airport security unnoticed and required regular maintenance. “Let me tell you how difficult it is for this man to disappear from this world,” Mr Roux said. Because of the seriousness of the charges, Mr Pistorius’s defence team have to prove there is an “exceptional” reason for him to be freed on bail. On Thursday, police replaced their lead detective in the case, Hilton Botha, after it emerged he faced attempted murder charges. South Africa’s most senior detective, Lt Gen Vineshkumar Moonoo, will now take charge of the investigation. Det Botha is expected to appear in court in May in connection with a 2009 incident in which he and other officers opened fire on a minibus taxi whose driver apparently disobeyed an order to stop. He has not been suspended and could remain a potential witness in any trial of Mr Pistorius.